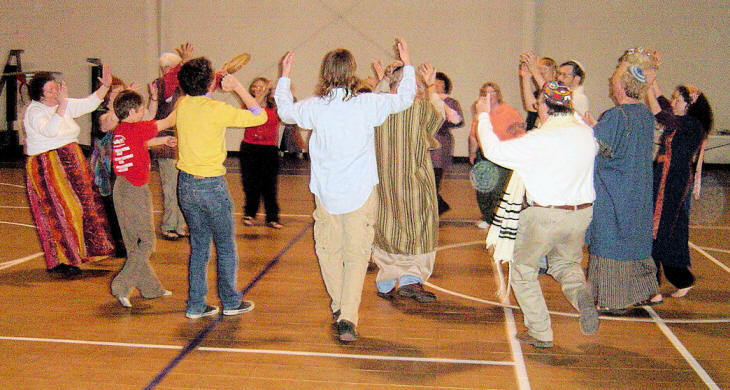 In November of 2006 our Israeli Folk Dance Class, which had been meeting at THE RIVER Church in Lincolnton, ended when THE RIVER disbanded. We waited to see which door YHVH would open for us next. 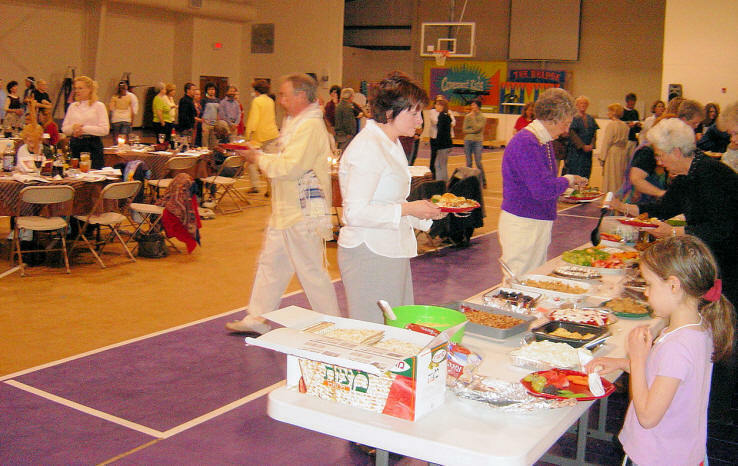 In January 2007, the door opened for us to meet at Covenant Bible Church in Lincolnton, the same location where we had met from 1999 - 2002. 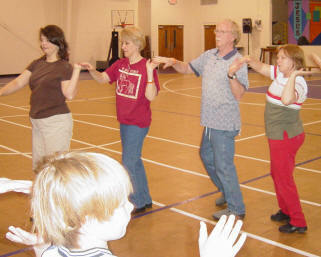 Machol Dance Ministries resumed dance classes on Tuesday nights starting February 13, 2007 in the Covenant Bible Church Family Life Center. 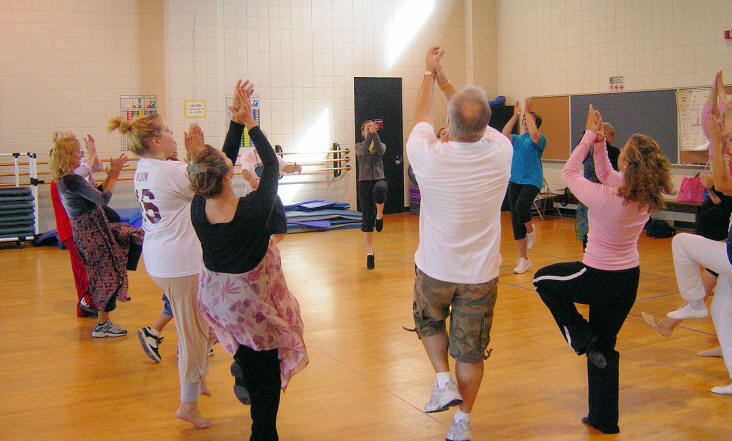 We decided to have a 6-weeks class for Beginners from 7:00 to 7:45. 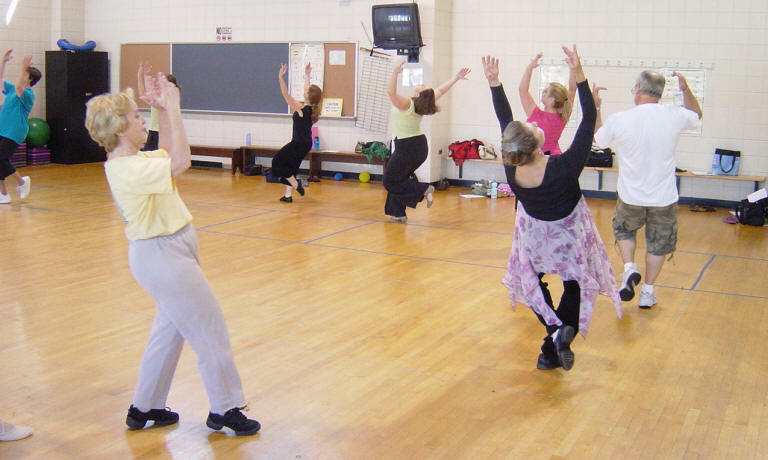 Intermediate/Advanced Dancers would meet from 7:45 to 8:30. 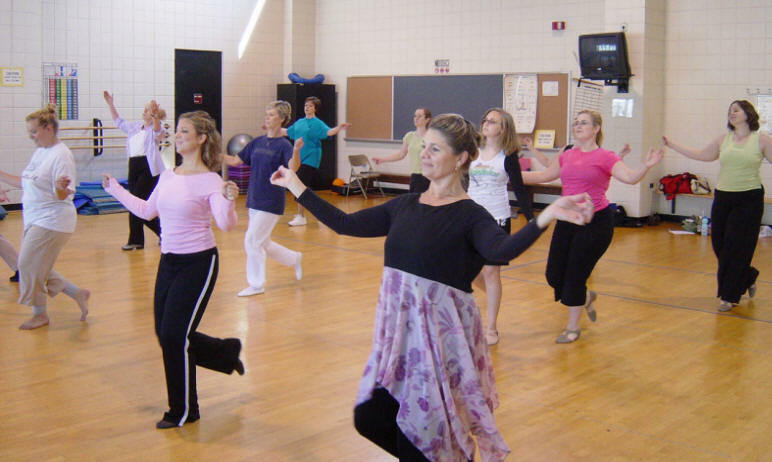 The ages of dancers ranged from 4 to 70+. It's amazing seeing such a diverse group of about 30 people dancing together, enjoying each other and praising God. Hand positions - Right hand facing up, Left hand facing down. 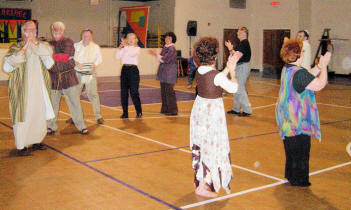 We use a Hassidic Hand hold for the dances Zemer Atik and Hora Chadera. 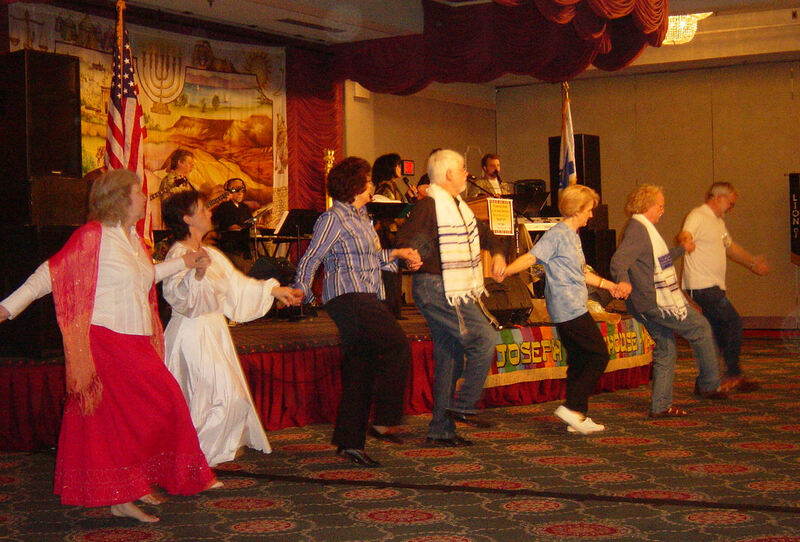 Mayim is a Hebrew word that means "water" but also a basic step in Israeli Folk Dance. When Queen Vashti refused to appear before King Ahashuerus and his nobles, he gave her the "royal boot" and selected Hadassah/Esther as his new queen. King Ahashuerus' right-hand-man, Haman, hated the Jews and made a plan to have all the Jews living in Persia Media killed. He cast the "pur" and the date selected for his evil deed was Adar 13. 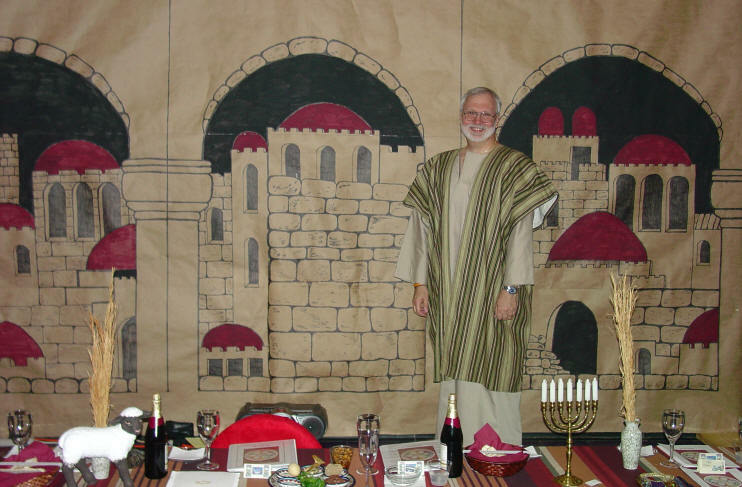 Mordechai went to Esther and told her that she must go to King Ahashuerus and plead for her people, the Jews. Esther knew that if the King failed to extend his gold scepter to her it could mean her life. When she came into his court, he extended his scepter to her and offered her half of his kingdom. 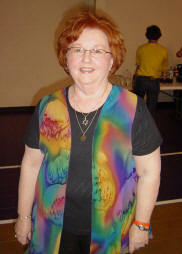 She only asked that the King and Haman come to a meal she would prepare for them the next day. When Esther revealed Haman's wicked plan for the Jews, the King ordered him hanged on the gallows he had built for Mordechai. 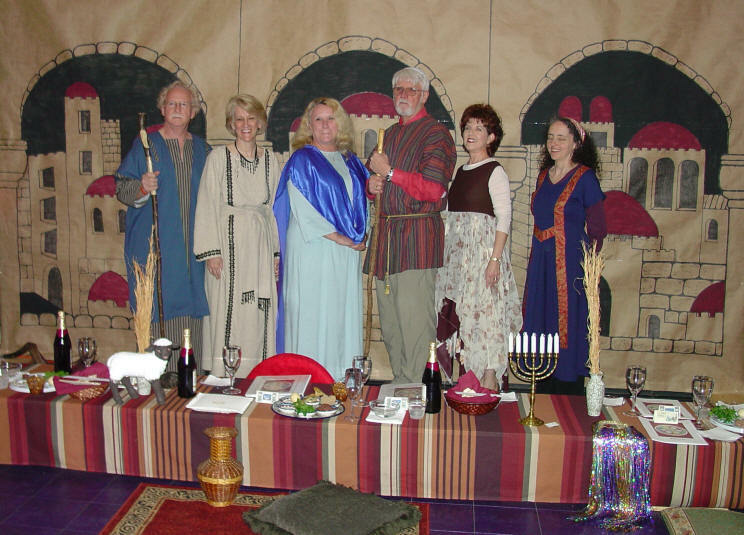 Vision For Israel and The Joseph Storehouse was established in 1994 and is an international non-profit humanitarian aid center operating in the Judean Hills just outside of Jerusalem in Israel, by its Founding Directors, Barry & Batya Segal. As a multifaceted charity, they supply essential emergency relief to Israel's impoverished individuals and to a broad base of large organizations desperately in need of many important supplies. 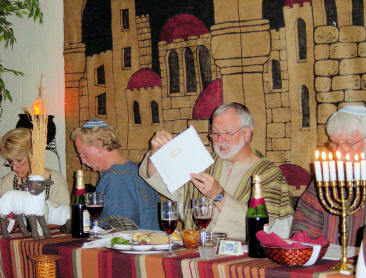 They freely provide aid to the poor and needy Jewish and Arab people living in the nation of Israel. Many of these people are struggling as orphans and widows, homeless and handicapped, senior citizens and geriatric patients as well as new immigrants and victims of terrorism and their families. Through the relief and assistance from Vision For Israel and The Joseph Storehouse, food, clothing, toiletries, kitchen and household items, blankets, towels, linens and toys are some of the supplies they distribute on a weekly basis. 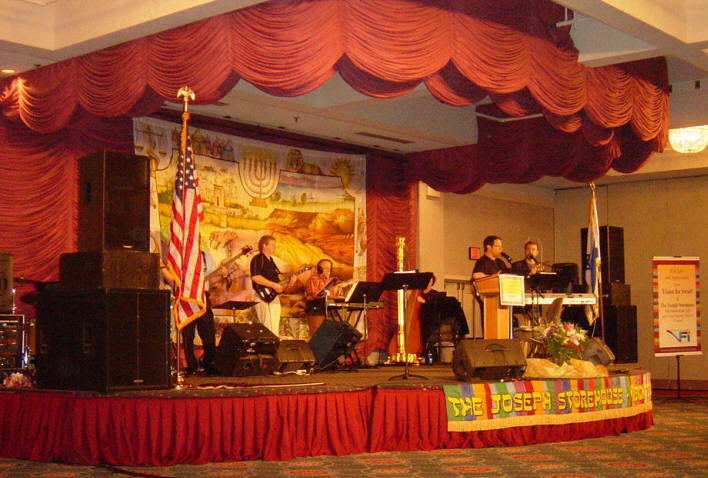 Barry & Batya came to Charlotte, NC on March 22 - 24, 2007 for the "Highway to Jerusalem" Conference and to dedicate the opening of their national headquarters in the US, which is located in Pineville, NC. 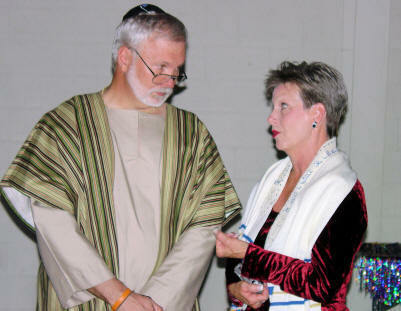 (Left) Claren McQueen prays over Barry Segal at the Vision For Israel & Joseph Storehouse dedication. 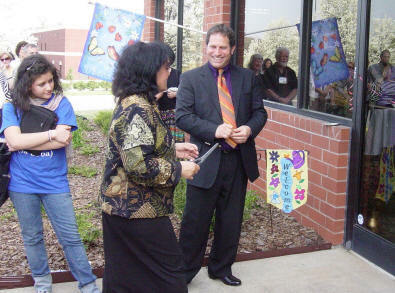 (Right) Batya prepares to cut the ribbon to the entrance of the building. 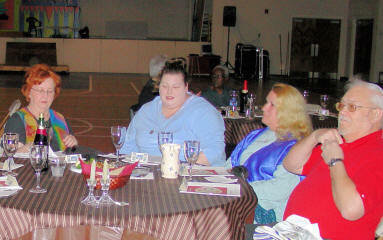 (Left to Right) Jane & Andy, Paul & Susan, Carolyn (& Curtis, photographing), Lynda & Doug attend the conference and dedication. 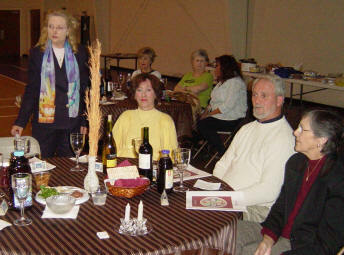 The Vision For Israel & Joseph Storehouse Conference took place in the Conference Room of the Heritage International Ministries, formerly Heritage USA/PTL. Barry & Batya Segal and Claren & Nancy McQueen lead the group in Praise & Worship. We always take advantage of opportunities to dance during Praise & Worship. 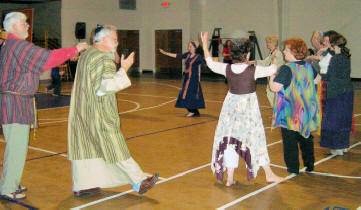 ... and are joined by Resurrection Dance Ministry and others attending the conference. 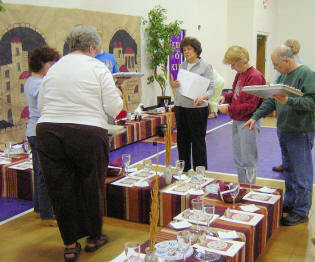 We held our Pesach Seder for 2007 at Covenant Bible Church in Lincolnton, NC in their Family Life Center. 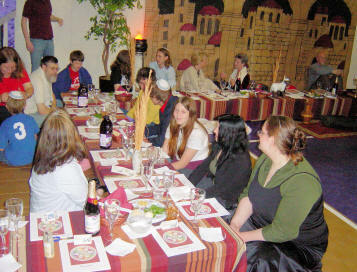 Our attendance for the 2006 Seder was 70 and we hoped to increase the attendance for the 2007 Seder to 100. 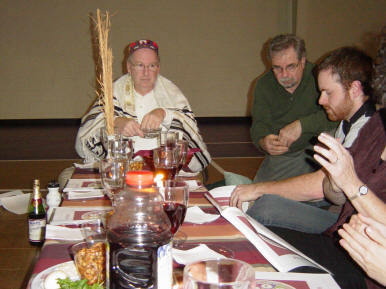 We met the evening before the Seder to set things up. As we had hoped, we had 100 registered to attend. 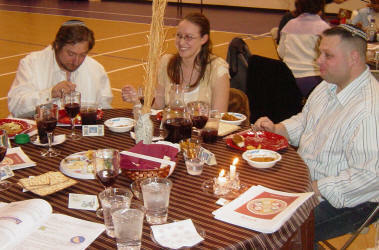 Low and Regular tables had to be set up with tablecloths; Seder plates, wine glasses, festival candles and Haggadahs had to be placed. 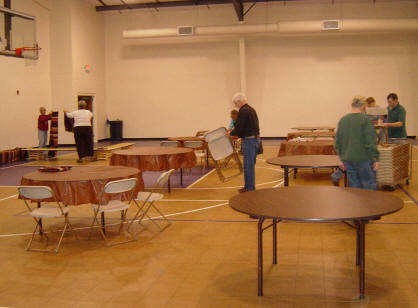 The Tables were set up on half of the Family Life Center (Gym). 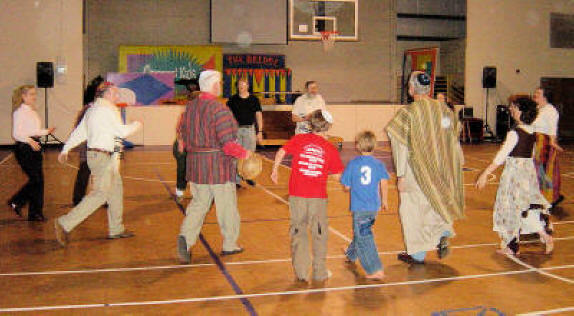 The other half of the gym was left open for some Israeli Folk Dance as we concluded the evening with a time of praise and worship. 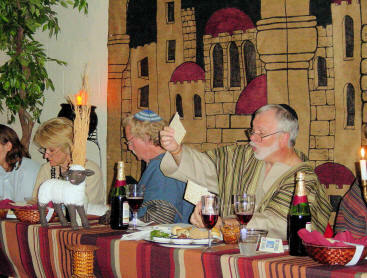 Some chose to wear Biblical-style costumes. 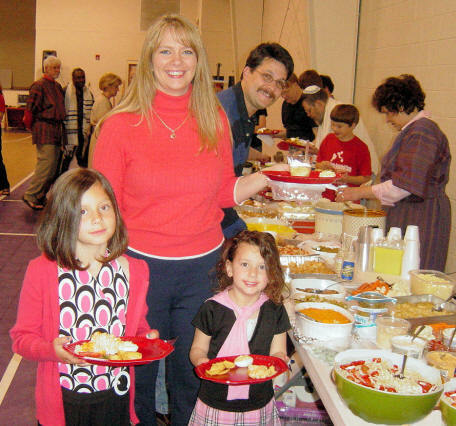 It was wonderful seeing so many families come together to celebrate Pesach. 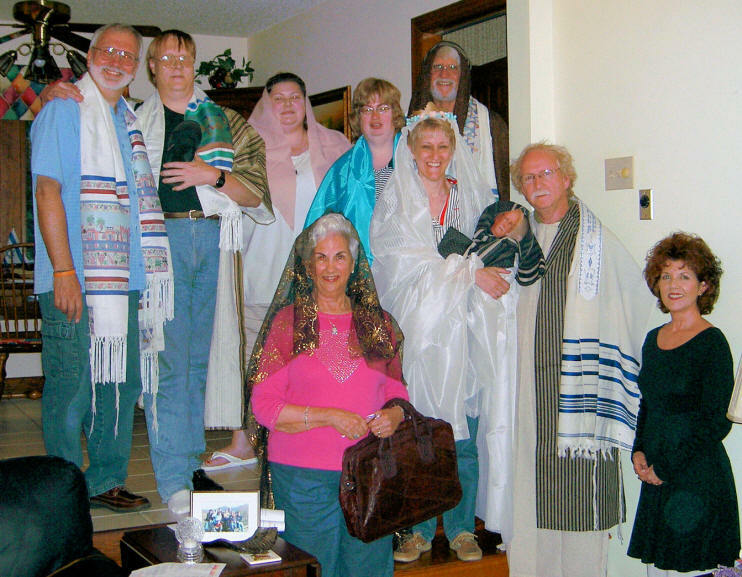 Jew, Gentile, young, old - all gathered together for this appointed time. As the evening begins, we light the festival candles. 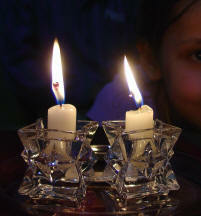 Asher kidshanu bidevaro u'vishmo anachnu madlikim haneyrot shel yom tov. Who has set us apart by His Word, and in whose Name we light the festival lights. 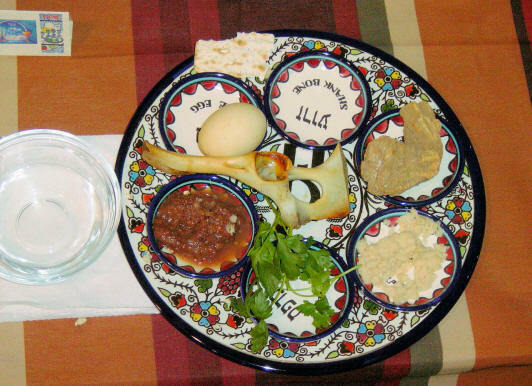 The Seder plate contained parsley, horseradish, a horseradish root, a lamb bone, an egg and haroseth. 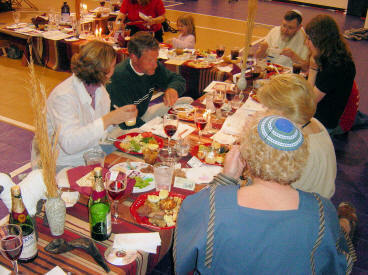 Four cups of wine are poured and drunk during the Pesach Seder. Each cup has a specific meaning. A matzahtash contains three pieces of matzah. See how the matzah is pierced and striped. The middle piece is taken out and broken. The blessing is recited. Half of the broken piece of matzah is wrapped in a white cloth and hidden away. It will be "redeemed" later if a child has found it. The cup, a symbol of joy, is filled a second time. We remember the great cost at which redemption was purchased. As the 10 plagues are recited three times, we dip our finger into the cup of wine and allow a drop to fall, reducing the fullness of our cup of joy this night. Blood! Frogs! Lice! Beast! Cattle Disease! 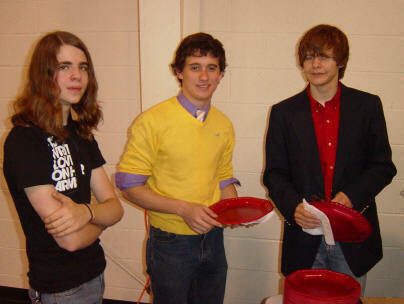 Boils! Hail! Locusts! Darkness! Death of the Firstborn! Unleavened bread (matzah) is eaten during the 7 (or 8) days of Pesach. Beth, with her husband, Brad, and their children Savanna & Alexandria. Bruce & Becky with their family. 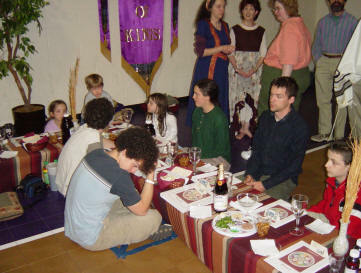 (Above) It was nice having so many teenagers join their families and friends for the evening. 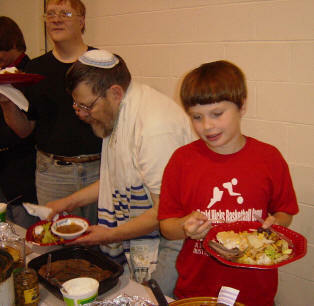 Joe (Left) spends some time talking with the Berkowitz family. 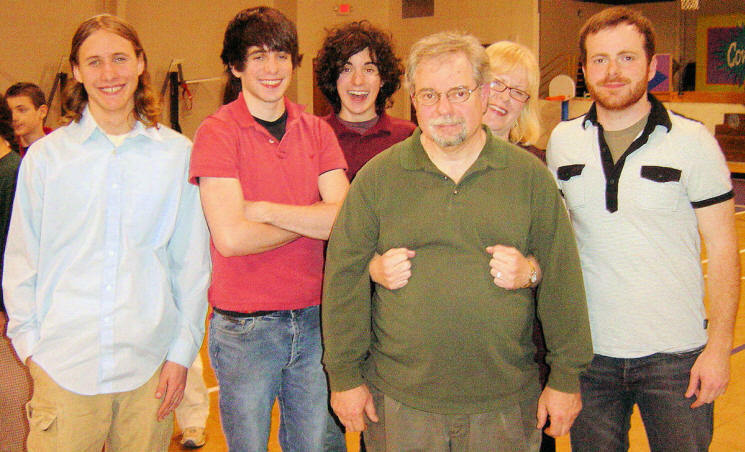 Bruce & Kathy were joined by their three sons, Grayson, Zachary & Benjamin. 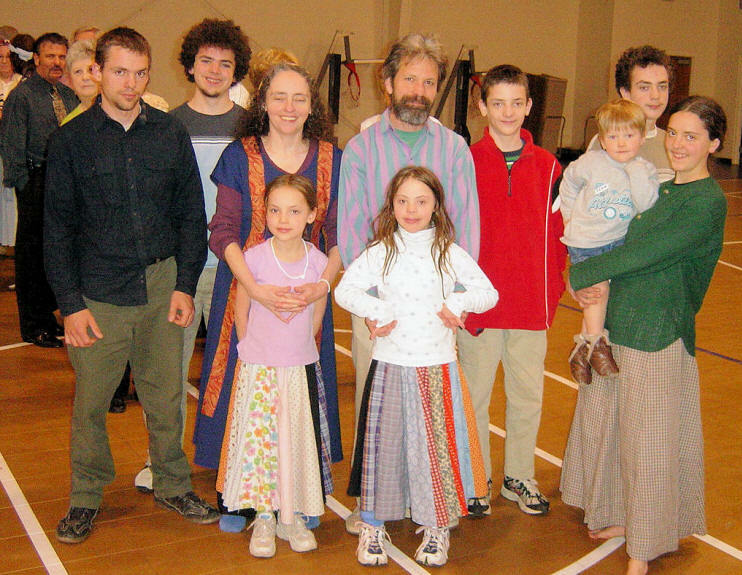 (Left) Andy & Jane with 3 of their children - Mary, Peter and Sam. 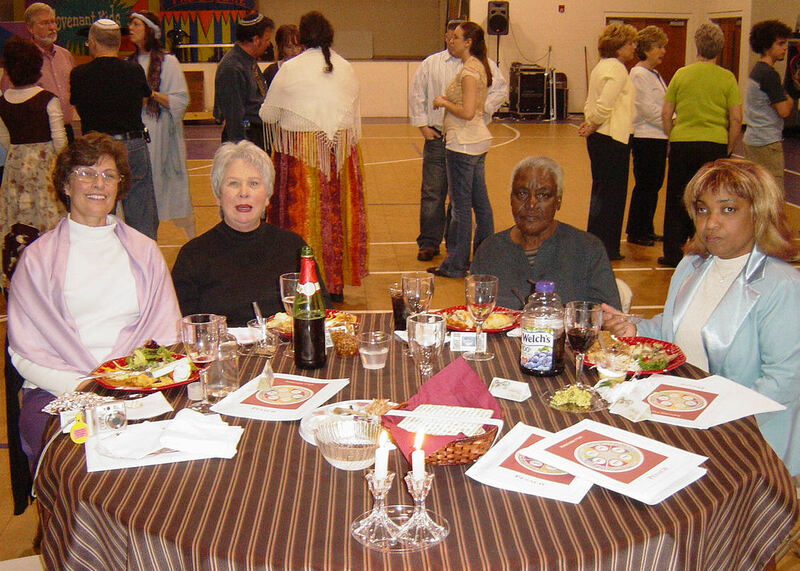 (Right) Paul & Susan spent time with their friends Scott & Terry. 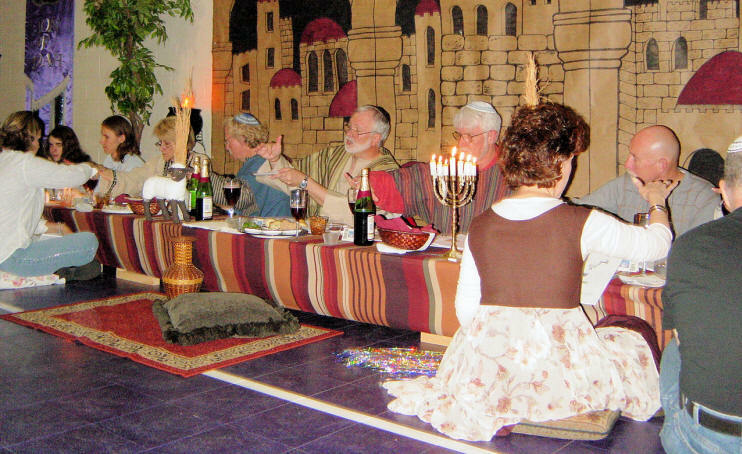 Some had been to many Pesach Seders before. 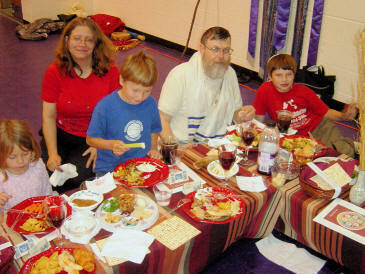 For others, this was their first Seder. 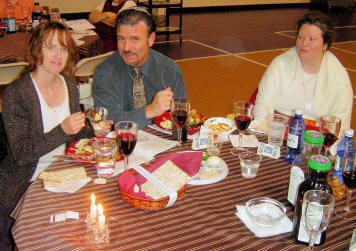 Some lived nearby, while others traveled a long distance in order to join us for the Seder. 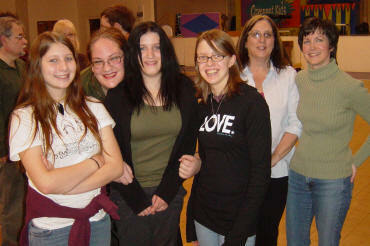 (Left) More of our teenagers and their moms. 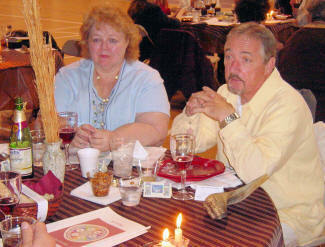 (Right) Bill & Nancy joined us again this year. 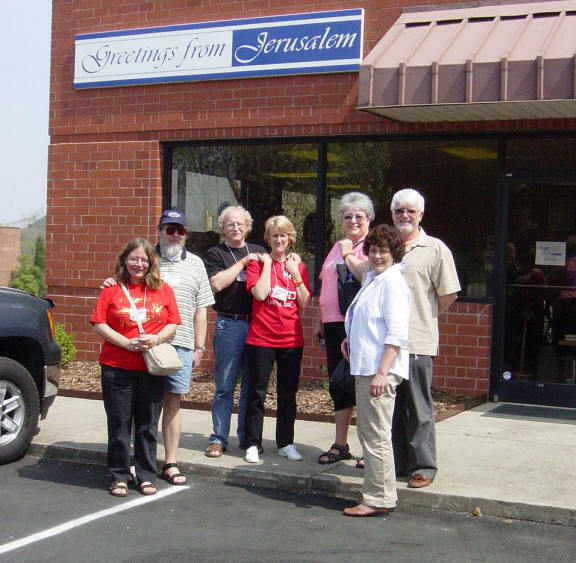 Old and new friends from Hope of Israel Congregation in Charlotte, NC joined us. 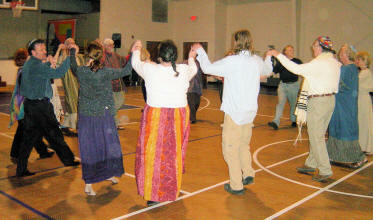 At the end of the evening, we spent some time in Praise, Worship & Dance. 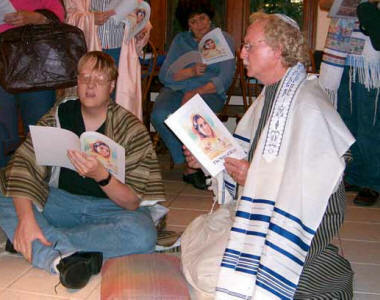 Jew, Gentile, Men, women, young, old, teenagers and children all joined us in worshipping Yahweh. the adults, teens and older children. Children learn so much from our example. 1 Corinthians 5:7-8 ... For our Pesach lamb, the Messiah, has been sacrificed. 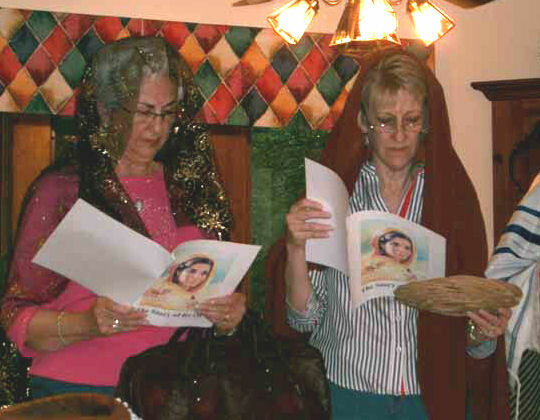 The Book of Ruth is read during Shavuot. The story tells of her marriage and conversion which took place during the harvest season, from the beginning of the barley harvest to the conclusion of the wheat harvest. Through her marriage to Boaz, Ruth, a gentile, became the great-grandmother of King David, who was born and died on Shavuot. She became the mother of the royal lineage of David. It was also from this lineage that our “Kinsman-Redeemer” came -Yeshua Ha’Mashiach, Yeshua the Messiah. 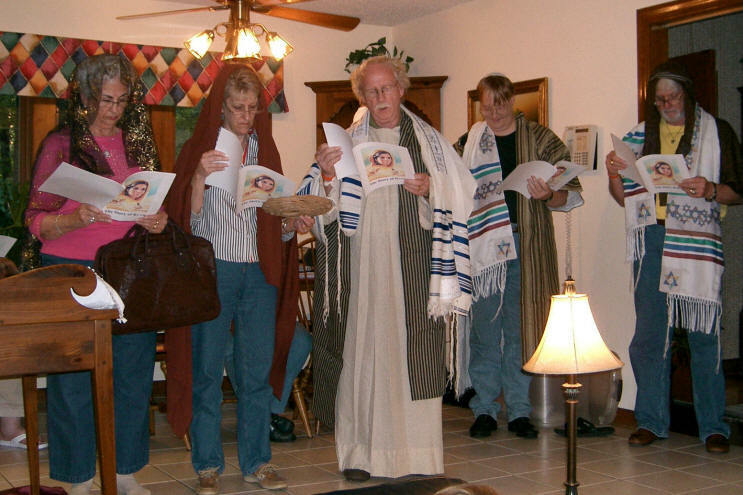 Rather than read Ruth, we had our second annual Shavuot play. 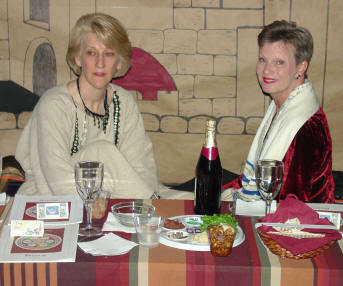 The characters are cast spontaneously on the night of the play, which adds to the fun of the evening. 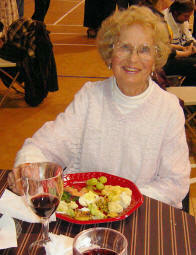 After the death of their husbands, Naomi (Doris) encourages her daughter-in-law, Ruth, to return to her home and people. Ruth refuses, saying, "Don't urge me to leave you. Where you go I will go, and where you stay I will stay. Your people will be my people and your God, my God. Where you die I will die, and there I will be buried. May the LORD deal with me, be it ever so severely, if anything but death separates you and me." Ruth tells Naomi that she will go to the fields of Boaz, a Kinsman-Redeemer, to pick up the leftover grain. Ruth finds favor in Boaz's eyes and he tells her that he will "redeem" her if a nearer kinsman will not. 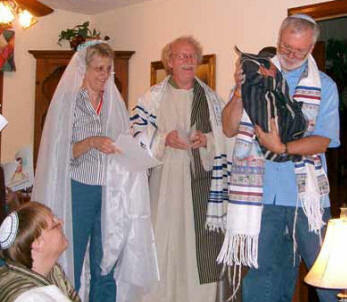 The nearer kinsman (left) declines the opportunity to redeem and marry Ruth, giving Boaz the opportunity to do so. After their marriage, Ruth gave birth to Obed. Boaz was the father of Obed, Obed was the father of Jesse, and Jesse was the father of David, who became King over all of Israel. 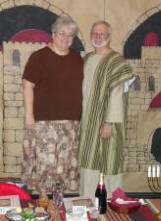 (Below) Ruth & Boaz see baby Obed for the first time during the play. It was our privilege to be back at the Zion Center Worship Arts Conference again this year. 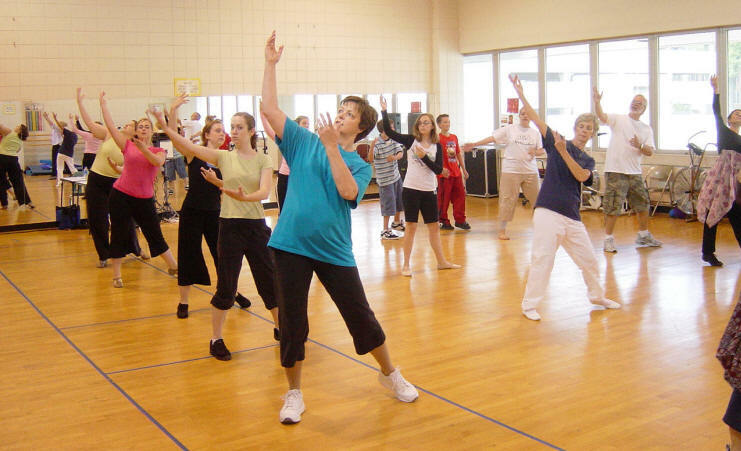 This was the 11th year for this "Dance Camp" that is sponsored by Resurrection Lutheran Church in Charlotte. 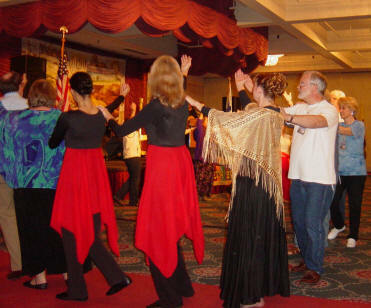 Carolyn and I had the opportunity to teach each morning July 23 - 27 in the Israeli Folk Dance technique block. 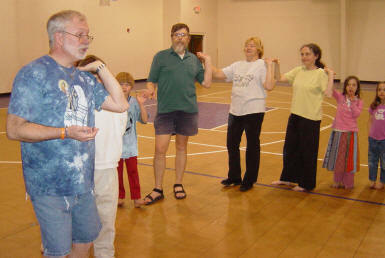 Working on the dance "Sulam Yaakov/Jacob's Ladder"
The class was an hour and 25 minutes each day. 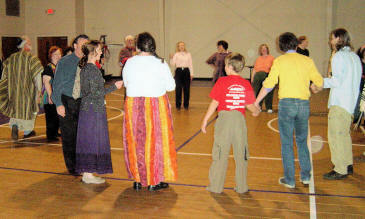 Classes included those who had no dance experience as well as those who had danced Israeli Folk Dance for years. On Monday we learned "Zemer Atik", "Od Lo Ahavti Dai", "Sulam Yaakov", "Debka Kafrit", "Mikamocha", "Shibolet Basadeh", "Mayim Mayim" and "Bai Ya Meem". It was a "full" morning. 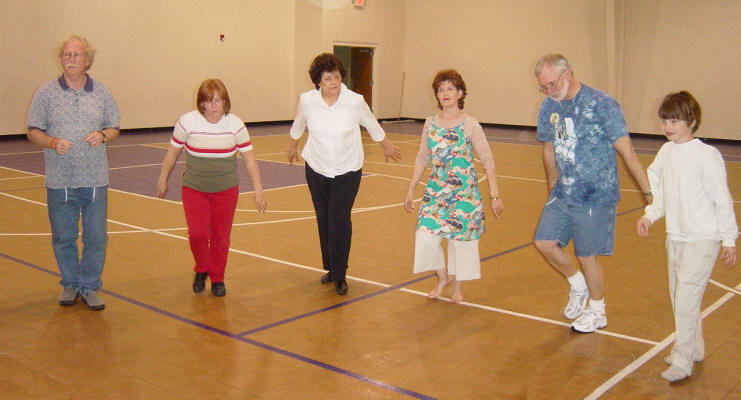 One of our dances for Tuesday was "Chofesh/Freedom"
Hop on Right, Lean back on Left - Right Heel forward"
We included Yemenite steps on Tuesday. 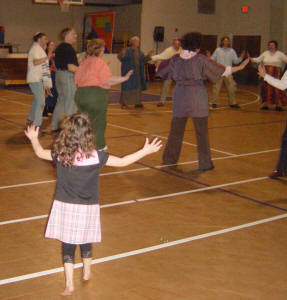 Dances were more advanced, so we didn't cover as many. We learned "Chofesh", "Hine Ma Tov", "Hora Chadera", "Hora Kendal" and "Sheleg Al Iri". "Hine Ma Tov / Behold How Good"
We learned 3 different variations for the second part of "Hine Ma Tov"
"Sheleg Al Iri / Snow on the Mountain"
We gained a few new dancers Wednesday. 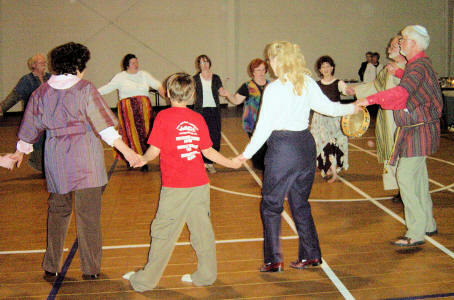 Dances for the morning class included "Tsadik Katimar", "Sisu V'Simchu", "Hora Agadatti" and "Debka Mimouna". 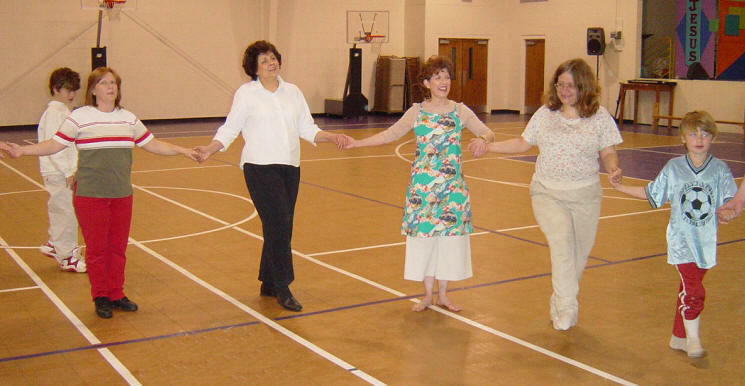 I picked up an extra class for eight ladies who were interested in Israeli Folk Dance, but had never danced before. 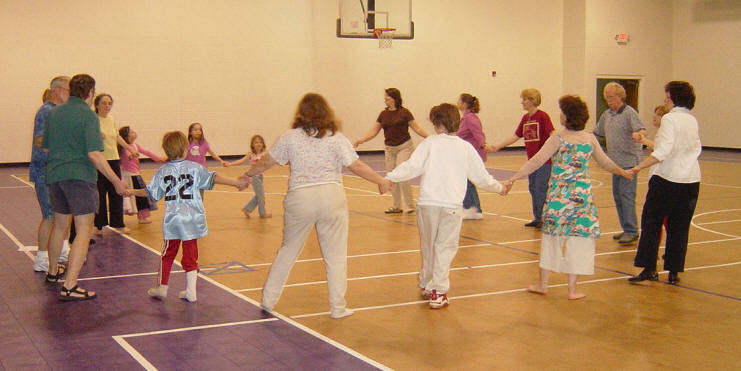 We had a wonderful time as they learned basic & Chassidic hand positions and Israeli Folk Dance vocabulary - mayim, balance, coupe, tcherkessia, yemenite, hora, and so on. 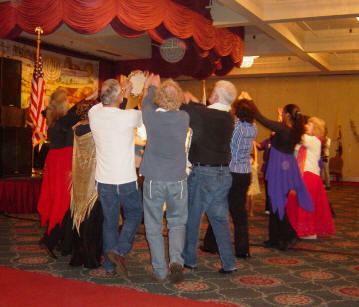 They had never done Israeli Folk Dance before, but they did great and their enthusiasm was contagious! They learned Mayim/Balance/Skip-Hop, "Zemer Atik" and "Im Hupalnu". 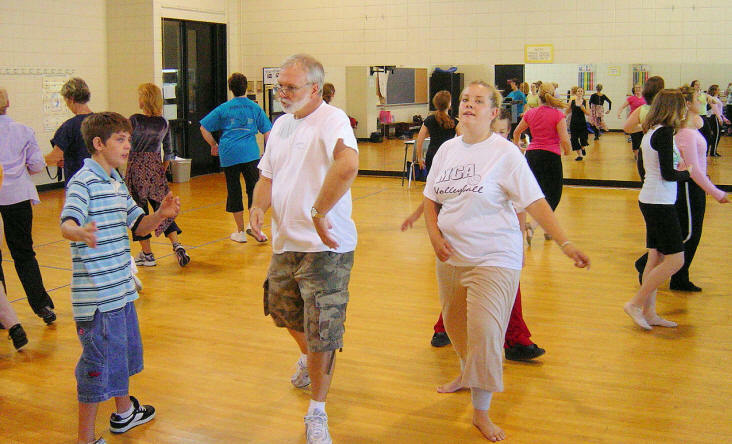 On Thursday we moved to one of the dance studios at Central Piedmont Community College and gained some students from the Ballet & Modern Tracks. We learned "Od Lo Ahavti Dai", "Sisu V'Simchu", "Shir Ha Shirim" and "Sing & Dance". 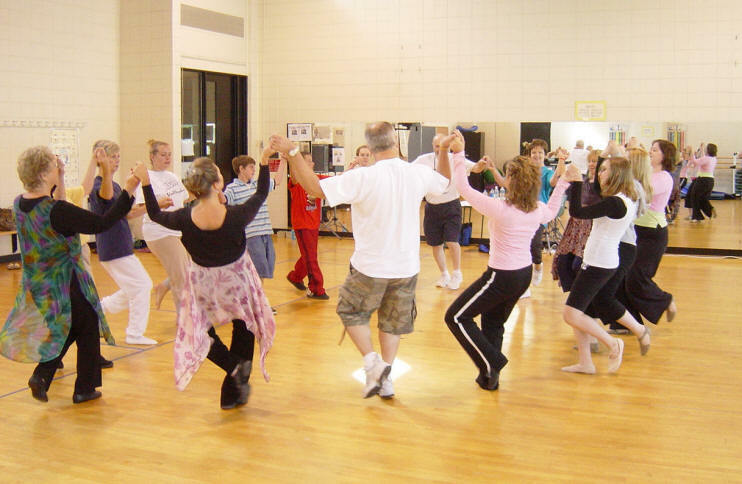 We started with the lively fast-stepping dance, "Od Lo Ahavti Dai"
"In 2 3 Clap, Out 2 3 Double-Clap"
"Shir Ha Shirim - Song of Songs"
"Can you tell me how to do that step again?" Dancers line up behind me as we worked on Jonathan Settel's "Sing & Dance"
"Walking Right Left Right Left, Tcherkessiah"
On Friday we continued to work on Jonathan Settel's "Sing & Dance", "Shir Ha Shirim/Song of Songs" and learned to dance to Paul Wilbur's "Kadosh" - a wonderful worship dance. 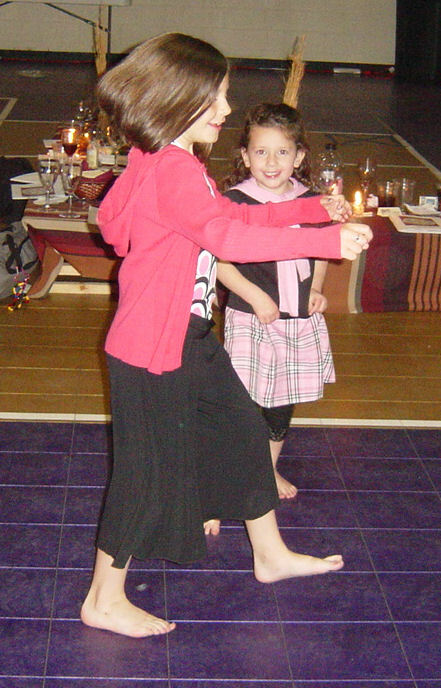 Pretending that we have just lit Shabbat candles, the dance begins. "Tcherkessia to the center, eyes covered, Right 3-point-turn, Tcherkessia to center, Left Mayim." "Step Right, Drag Left, Step Right, Drag Left"